The Port of Los Angeles is the busiest container port in the United States, but only the 16th-busiest in the world. Approximately $1.2 billion worth of cargo comes through the facility each day and more than 165 million metric revenue tons of cargo are moved here each year. The most-imported types of goods are furniture, automobile parts, apparel, electronic products, and footwear. Look closely at this Overview and you'll see “The Green Cathedral” - an artistic planting of 178 Lombardy poplar trees near Almere, Netherlands. The “Cathedral” is 50 m (490 ft) long and 75 m (246 ft) wide, which mimics the exact size and shape of the Cathedral of Notre-Dame in Reims, France. The artist, Marinus Boezem, also made a clearing in a nearby beech forest of the same shape to suggest that as the poplars decline, beech trees will fill the empty space to symbolize a cycle of growth and decline. On Tuesday, new data from the Chinese government revealed that the country has been burning up to 17% more coal each year than previously disclosed. While president Xi Jinping recently promised to halt the growth of his country's carbon dioxide emissions by 2030, the new figures mean that China has been burning an additional 600 million tons of coal each year. The sharp upward revision in official figures means that China has released much more carbon dioxide — almost a billion more tons a year — than previously estimated. This Overview shows the coal terminal at the Port of Qinhuangdao - the largest coal shipping facility in China. From here, approximately 210 million metric tons of coal are primarily transported to coal-burning power plants in the major cities in southern China each year. This figure is believed to account for approximately half of the country’s annual consumption. Chimalhuacán is a city with more than 600,000 residents in the eastern part of the State of Mexico, Mexico. The colorful strip seen across the bottom of this Overview is a open-air market known as a tianguis. Here, merchants cover their stalls with vibrant canopies to protect themselves from harsh sun and inclement weather. Arrowhead Stadium and Kauffman Stadium are home to the Kansas City Chiefs (football) and Kansas City Royals (baseball). It was a great weekend for both teams as the Chiefs defeated the Detroit Lions and the Royals triumphed over the New York Mets to win the World Series. The combined seating capacity of the stadiums is 114,319. 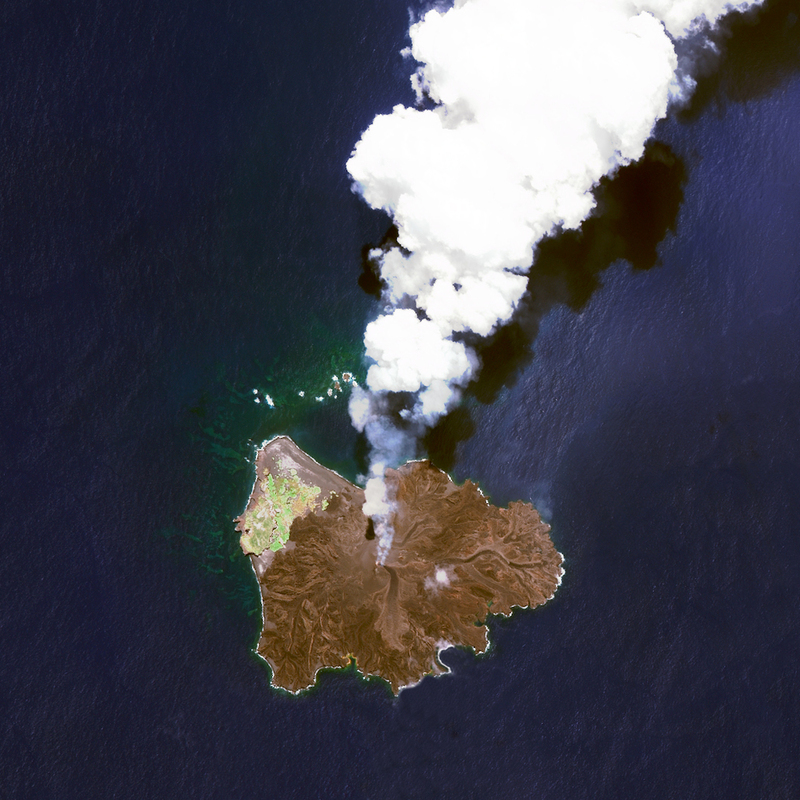 Nishinoshima is a volcanic island located 940 kilometers south of Tokyo, Japan. Starting in November 2013, the volcano began to erupt and continued to do so until August 2015. This Overview was captured on 7/1/2015. Over the course of this activity, the island grew in size from .056 square kilometers to 2.3 square kilometers. The Arlit Uranium mine is located in Arlit, Niger. French nuclear power generation as well as the French nuclear weapons program are dependent on the uranium that is extracted from the mine - more than 3400 tonnes per year.